MyServicePride sent me a personalized coffee mug to review. My iPhone camera and bad lighting don’t do this mug justice. The ribbon colors are actually very bright. MyServicePride.com specializes in personalized symbols of service for military members, retirees, and their families. Products include decals, plaques, t-shirts, water bottles, license plate covers, mugs, phone covers, and iPad covers. MyServicePride was founded by Sgt. Matt Massie, USMC, 1996 to 2006. Read more about his story HERE. My mug looks awesome! I chose the 15 oz. mug with a black interior and used the website software to design my ribbon rack based on the Army awards I’ve received. It’s dishwasher safe, and I’ve been using it almost daily for a couple of weeks now. It’s a good size for a coffee addict like me. What I really like about MyServicePride is how they are constantly adapting and adding to their site. They are very willing to work with people to create custom designs. The staff at MyServicePride has also been collecting information to add National Guard awards. They’re looking for photos and help with documentation, so if you’re a member of the National Guard, visit HERE to see how you can help. It’s a massive project! Since I ordered my mug, they’ve added some new designs. Rank insignia mugs are now available, and they look really sharp. I’m going to get Hubby the Navy one. 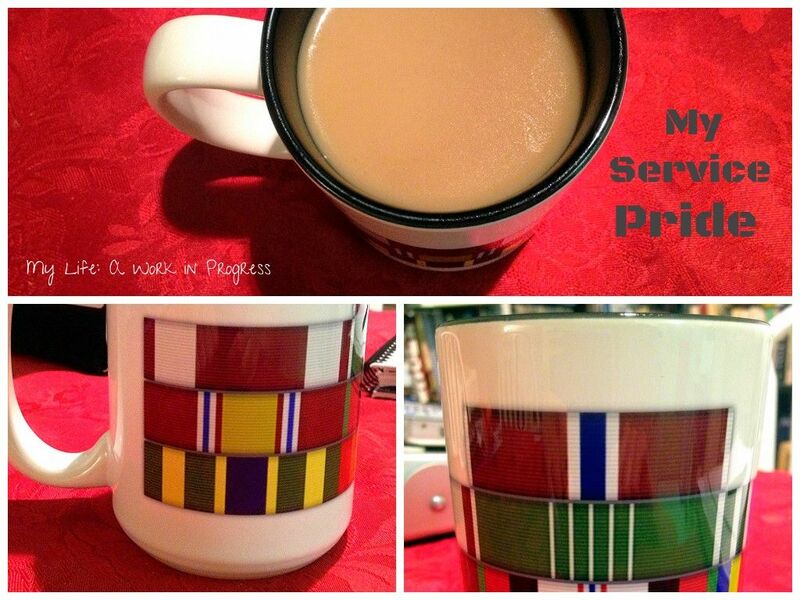 You can customize each of the rank insignia mugs by service branch and rank, and include optional text. The Navy rank insignia mugs let you take customization even further, by adding the Sailor’s rate insignia. Check out MyServicePride.com to see what they have to offer. You can even read personal stories from veterans and share your own. I really like this idea, thank you for sharing! What a wonderful gift this would make! I have a lot of family members in the military. I love this! I wish I knew about this while my husband was in! These are really neat! I like that you can personalize them. All I see are products that have specific information on them, so it’s nice to see something different! That is so cool! I have an uncle in the service who is also a coffee addict, I think this would be perfect for him! I love this! I never heard of them before. This will be great for the up coming holiday season to give as gifts. I can’t help but think that these would be a great holiday gift for a serviceman or woman or the family member of one! Even better than you can personalize them so much! I WOULD LIKE TO KNOW HOW TO CONTACT YOU GUYS IN REGARDS TO ORDERING COFFEE MUGS WITH RIBBON RACKS ON THEM. I HAVE ONE NOW AND LOVE IT AND WOULD LIKE TO ORDER SEVERAL FOR GRAND CHILDREN. J HOW DO I CONTACT YOU?????? Hi Don, I went and checked out their website, which doesn’t exist anymore; I’m sure you’ve already checked that. It looks like they’re no longer in business, unfortunately. I found a company called Pride of Service, and it looks like they make similar mugs. Perhaps you could check them out?